Of course, as soon as I got this lovely combo on my nails and headed outside to take pictures, it started to downpour. Connecticut weather has been kind of gross lately. It's either baking hot and 100% humidity, raining, or threatening to rain. 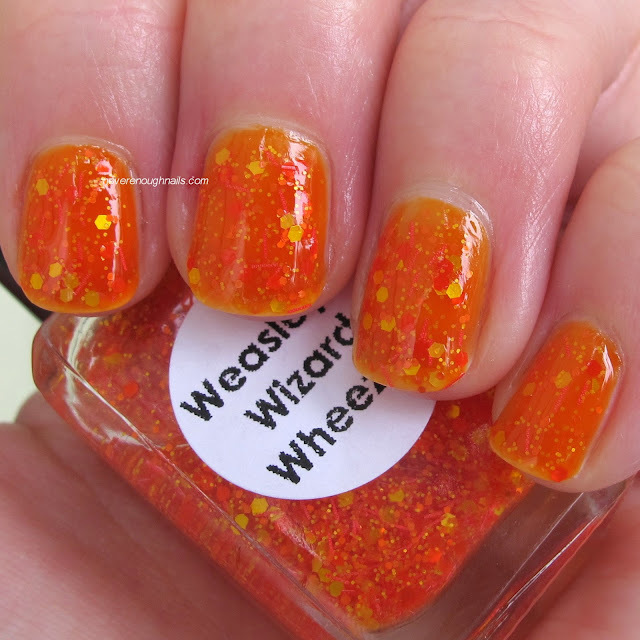 Despite the bad lighting and raindrops, I hope you can tell that Lac Attack Weasley's Wizard Wheezes is a lovely mix of orange, yellow and red glitters. This polish is named after the joke shop owned by two of my favorite characters in the Harry Potter books, Fred and George Weasley. They basically provide a lot of laughs throughout the series and are also the stars of my favorite scene from the books (their exit from Hogwarts LOL). The colors in Weasley's Wizard Wheezes definitely remind me of the red-haired twins! This is two coats of Weasley's Wizard Wheezes over two coats of L'Oreal Mango Mamma. Mango Mamma is an excellent tangerine jelly, by the way. I need to see if I can pick up some more of those L'Oreal jellies for sandwiching and glitter undies. 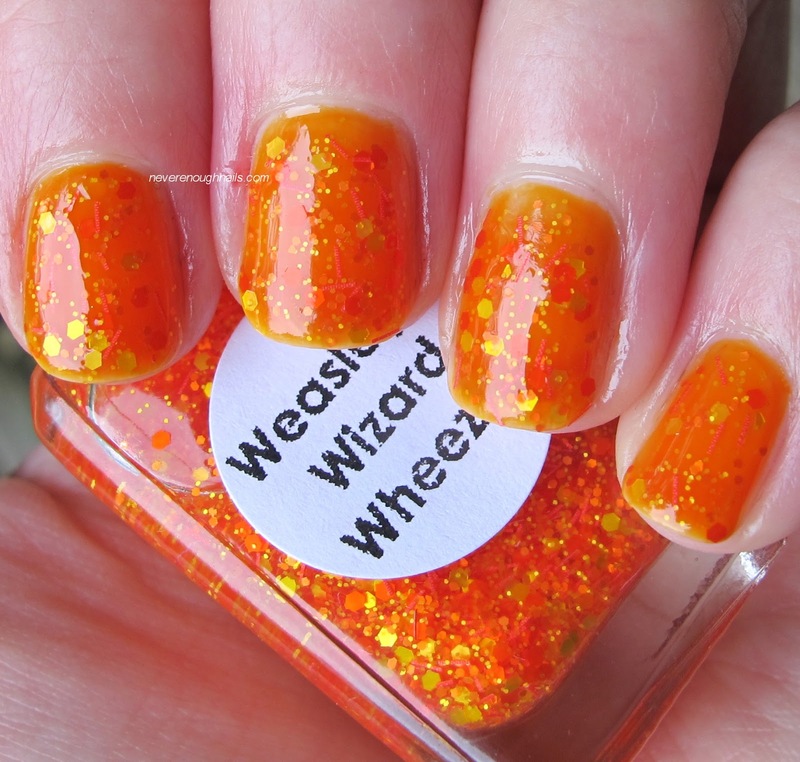 Weasley's Wizard Wheezes has lots of glitter, but isn't thick at all. It was easy to get a nice selection of glitter on the nail using the dabbing method. You can purchase Lac Attack polishes on her website. Like Lac Attack on Facebook to get the latest news about restocks. The Magical Musings polishes are all currently out of stock, but she has said that she will keep restocking them until no one wants them anymore. I think that's awesome by the way. There's nothing worse than wanting an indie polish so badly and not being able to get it. This looks like a great combo over the jelly! I'm in CT too and the weather has been so fickle and horribly humid! 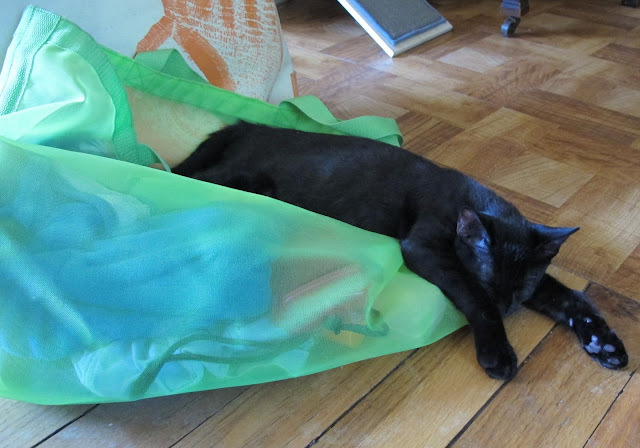 Such a drag. I loved this even more in person Frosso! I need find more of these L'Oreal jellies. And how about the weather today?? I think I melted!